i've cought small brownies from the weir down at the junction but on bait might be worth looking around the next weir down seen as its free fishing had a couple of decent browns on small lures last year and plenty of chub, i'll be putting a few flies about down there. as for the dearne theres enough to go at, don't worry about where wakefields water ends as the rests free anyway until you get down to darfield theres a short stretch thats on a yearbook then below that its free all the way to the don as far as i'm aware. Last edited by mart_s; 15-01-2010 at 04:52 PM. Well I'm doing my bit for the Calder catchment (and the Aire too with another collegue).....did you know that theres a national directive which states that we should have sustaining populations of migratory fish in ALL our rivers by 2021. The main barrier is the weirs of our industrial heritage and over the last couple of years we've made great inroads into rectifying the damage caused by this heritage. Along side those ....but longer term are Knottingley and Kirkthorpe(the two major bottlenecks)plus all the others are being prioritised and we are looking for the right oppertunity. Works starts this week on a stand alone fish pass at Boston Spa on the River Wharfe too. For Anyone fishing the Calder this weekend :The river, Friday, was running at normal levels ......unfortunately the Hebble was running gin clear but the Calder had a consented discharge sewerage smell and colour.I didn't have time to move upstream of the outflow as it was after 3pm when I arrived....so my tip for the weekend....get yourself above the sewerage works if they are discharging as the snow melt water may not hit the river for some time yet. a good friend of mine thinks that some salmon might be bypassing knottingly weir and entering the canal for a short period. The Yorkshire Gamefishers would like to extend a warm welcome to anyone who would like to attend our next meeting to be held on Monday the 18th January at Ossett Cricket Club commencing at 8pm, where the guest speaker will be Phillip Bailey (Flyfishwithme on this forum) who will be giving a talk about "North Country Style Fishing and Fishing Down Under". Philip has fly fished for over 30 years on the Australian mainland, Tasmania, New Zealand, Canada, USA and the United Kingdom. He is a former guide in Tasmania where he specialised in wilderness fishing for wild brown trout. Since Mmoving to Yorkshire Phillip has become hooked on the traditional fly patterns made famous by the North Country School of fly fishermen during the 19th century. There is a small fee of £2.00 to all non society members with this being refunded if one decided to join the club for £8.00 per year. The societies aims are to promote the enjoyment gamefishing to all. The society meet on a monthly basis through out the winter months and arrange a small number of fishing excursions during the summer, with the emphasis being on the sharing of knowledge in a friendly good humoured manner. "There's only one way of life, and that's your own, that's your own, that's your own" The Levellers. Thanks again guys for the replies, will be giving it a try and post as to how I get on. Wish I had the couple of K`s to spare, can offer a pair of hands if assistance is needed - location and elderly parents permitting. 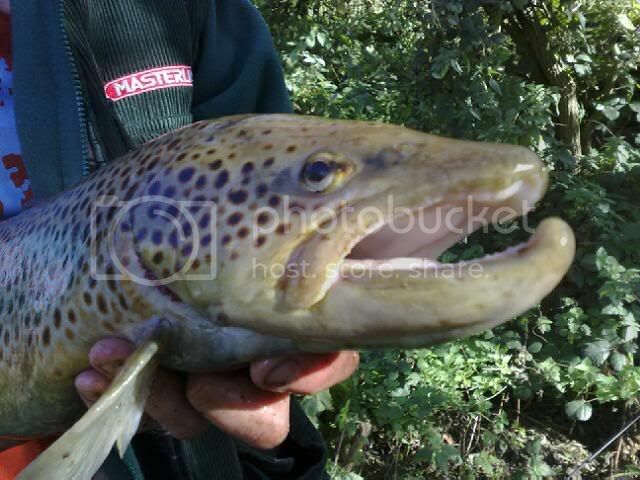 Following on from mart_s item with monster trout pics from course fishing stretches of Yorkshire rivers, I spotted this the other day on the Bingley Angling Club website from August 09. 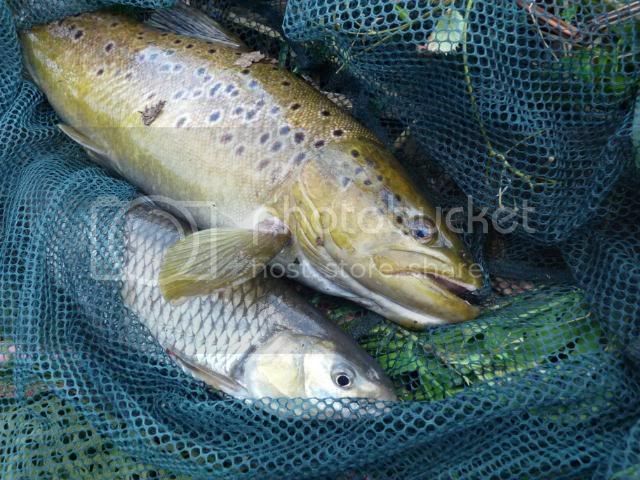 A 7 1/2 lb Brown Trout was caught by a first time Angler in the River Aire – Bingley Length. Novice angler – Brendan Bailey , 23, caught the ’zoo creature’ after purchasing a starter kit from KL Tackle , Keighley and a Bingley Angling Club Yearbook. He has been recovering from a serious accident some years ago and had to have the assistance of a friend to land the fish which took more than 1/2 hour to get in. The fish fell to a maggot on the feeder after a short while of Brendan starting to fish. Just goes to show you that there are some very big fish where you least expect them! The answer was a possitive yes... they didn't see a problem introducing this rule and it would be notified on the agenda for the AGM. So these leviathans should be safe in all Bingley waters now...notwithstanding pollutions and poachers. it seems the aire holds a number of large brownies and a few good rainbows have been caught around leeds town centre don't know where they've escaped from but i've heard of them to 8lb on coarse tactics my mate lost one at the net on bread punch. Hi - I thought i would answer your questions about the AGM in realtion to this post - as a club official of Bingley AC i thought i would be the best person for the job! The catch and release was indeed brought up at the AGM - but was outvoted on the basis of 'preaching to the converted'. We advise all our members to return fish to the water once caught and this does extend to trout. But we also have to give the option to people who do wish to take game fish. Most of our members (in fact i would dare to say nearly all) would not take a trout of that size anyway. we did, however - vote to reduce the number of fish to be taken in a day to one. Most members are fully aware that the fish that can be taken are the 'stockies' and generally abide by that. On a personal note - i would have liked to have seen the catch and release rule introduced for Trout over a certain size - but this is very difficult to police. In fact - we did put in the book this year - 'Do not take mature fish on unstocked waters - please support the clubs catch and release policy' to support this. Hope this clears this up. Last edited by chrisgallagher; 22-01-2010 at 09:44 AM.